In the southern hemisphere, all of the stars and constellations rotate around the South Celestial Pole (SCP). Unlike the northern hemisphere with its North Star, there is no ‘South Star’ situated at the point of the SCP. The Southern Cross and Pointers are used to navigate in the temperate and sub-temperate zones of the southern hemisphere. However, they are of less use to navigators in the southern sub-tropics. This is especially true during the southern summer, from October to March, due to the tilt of the earth northward so that the sun shines more directly at the Tropic of Capricorn, and less of the southern night sky is seen. In the southern sub-tropics the SCP is located close to the horizon. The Southern Cross and Pointers, being situated close to the SCP, are sometimes visible, but for long periods of the night they ‘set’ and drop below the horizon. At Alice Springs (virtually at the Tropic of Capricorn) in the summer months, the Southern Cross does not ‘rise’ (or become visible) until the early hours of the morning. Instead, south can be found using the stars Canopus and Achernar. With the SCP, these two stars roughly form an equilateral triangle. Two other constellations can assist in locating Canopus and Achernar: the Belt of Orion, and Sirius (also called the Dog Star). These four – Orion’s Belt, Sirius, Canopus and Achernar – describe an asymmetric arc in the night sky. 1. Start by locating the Belt of Orion. 2. Sirius, the brightest star in the sky, is in the opposite direction to (and in a straight line through Orion’s Belt from) Pleiades, the Seven Sisters. 3. Canopus is the second brightest star in the night sky. The angle of the arc of Sirius–Canopus from Orion–Sirius is about 135°, and the length of the Sirius–Canopus axis is about 1½ times that of Orion–Sirius. 4. Finally, Achernar is the brightest star in the constellation Eridanus. The angle of the arc of Canopus–Achernar from Sirius–Canopus is about 135°, and the length of the Canopus–Achernar axis is about the same as that of Orion–Sirius. 5. Using the location of Canopus and Achernar, project a third point outside the arc (on the convex side) which would form an equilateral triangle (a triangle where all sides are the same length). This projected point is the South Celestial Pole. (It lies roughly on the extension of the Sirius–Canopus axis). Drop a plumb line from the SCP to the horizon and you have south, accurate to within a few degrees. A star chart can help you to locate the constellations (such as those available from http://skymaps.com). Note: This is an addendum to section 5 of the Map Reading Handbook, edn. 2 (TASMAP 1991). 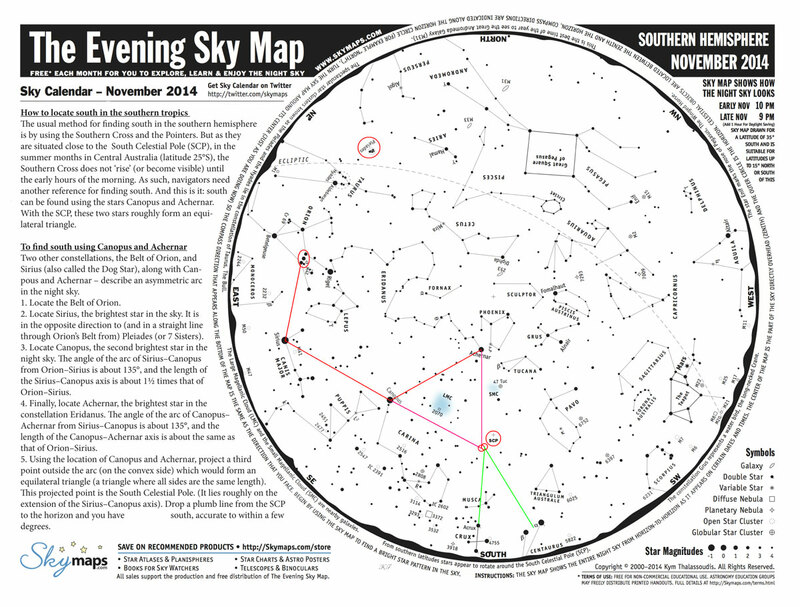 Star chart for Southern Hemisphere November 2014 from skymaps.com. Note: the southern hemisphere star chart is designed for use at 35°S (the latitude of Adelaide) and up to 15° either side of this latitude (as far north as Tennant Creek. For the southern tropics, refer to the Equatorial star chart. This entry was posted in Uncategorized and tagged navigation, south, stars. Bookmark the permalink.